Labor Day marks the official end of Chicago's busy summer tourist season, but that doesn't mean the Windy City slows down in September. On the contrary, along with cooler weather and fewer crowds, there are still plenty of seasonal activities, events, and attractions worth exploring on your trip. While typical summer tourist attractions like Millennium Park and the Navy Pier will be a little less hectic, September is prime time for theater season when most companies debut their fall productions. There's plenty to look forward to from the likes of the Goodman Theatre, Lyric Opera of Chicago, and the Joffrey Ballet. While it is highly unlikely that a tornado will make landfall in Chicago, the Windy City has been known to experience bouts of extreme weather in the past. The most severe tornado in Chicago was circa 1967. Additionally, Tornado Season for the midwestern United States (including all of Illinois) takes place from March through September each year, with more likely to occur toward the end of the season. Be sure to turn on your severe weather alerts on your phone if you're traveling during Tornado Season. As summer gives way to fall, the weather in Chicago fluctuates between summer warms and autumnal chills, which makes it hard to predict from day to day. However, temperatures range from a monthly average of around 74 degrees Fahrenheit (23 degrees Celcius) to a monthly low average of 55 degrees Fahrenheit (13 degrees Celcius). It also rains for about a third of the month (10 days), totally an average of 3.4 inches in September each year. Since the weather can be unpredictable, it's best to prepare for both summer and fall conditions when you're visiting Chicago in September. You should bring an extra layer, especially if you plan to be out all day and night without returning to your hotel room; a thin sweater or sweatshirt should do the trick. You should also bring comfortable shoes if you plan to walk a lot and a raincoat and an umbrella in case of a sudden storm—though you could also get some new rain gear at one of the popular Chicagoland shopping malls if you forget to pack your own. From one of the country's biggest jazz festivals to a music festival in Douglas Park that's said to rival Lalapalooza for its lineup, the city of Chicago plays host to a number of popular events each September. However, even though it's technically the off-season for tourism, tickets to many of these big-name events sell out fast, so make sure you book your reservation well in advance if you plan to attend. 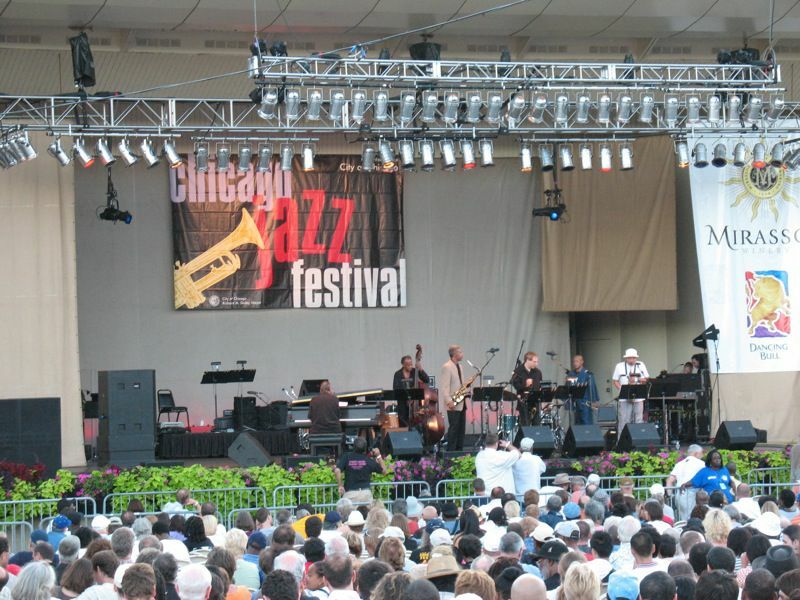 Chicago Jazz Festival: A major city music festival since 1979, this free event spans over Labor Day weekend (August 23 to September 1, 2019) and features jazz performances in Grant Park from genre legends and up-and-coming stars. Visitors are encouraged to bring lawn chairs and picnic baskets, and all ages can attend. African Festival of the Arts: Live music, markets, food and more are the attractions at this annual event taking place over Labor Day weekend, August 30—September 2, in Washington Park, which is transformed into a simulated African village for the occasion. North Coast Music Festival: Another significant live music festival, North Coast also takes place during Labor Day weekend. In addition to top-billed performances by Odesza and Bassnectar, the event features a number of high-profile house music deejays and takes place in Union Park. Chicago SummerDance: From June 27—August 24, learn some new dance moves or perfect old ones during this annual summer-long event taking place in Grant Park's Spirit of Music Garden. Here, participants can bust a move on a restored 4,900-square-foot, 100 percent recycled, open-air dance floor to programs ranging from bhangra to step dancing. Green City Market: More than 50 vendors are on hand at Green City Market. This bi-weekly event takes place all month long in Lincoln Park, is one of the largest markets in the country, and features chef demonstrations by local and nationally known professionals as well as events for school-age children. Riot Fest: This three-day event in Douglas Park will take from September 13 to 15, 2019, and is said to rival Lollapalooza with its musical lineup, which includes Blink 182, Beck, Elvis Costello, Incubus, Young the Giant, Interpol, Blondie, and Father John Mister this year. Chicago Gourmet: The annual Chicago food festival—sponsored by Bon Appetit, the Illinois Restaurant Association, and Southern Wine & Spirits of America—occurs in Millennium Park and showcases local, national, and international culinary talent. The Chicago Gourmet Festival will take place from September 27 to 29, 2019. The weather is warm enough to explore outdoors during one of the many walking and biking food tours, at least for the first half of the month. Hotel prices decrease due to the end of tourism season but airfare remains largely unchanged since many people still travel to the city for work. Chicago is a major destination for single tourists, and there are plenty of great hotels for single people in the city, many of which offer some awesome hotel packages with special discount pricing. There is a slight chance of flight or travel problems if a storm comes through, but there are also many places to dine and drink if you get stranded at one of the airports. After Labor Day, Chicago beaches are officially closed until the following summer, but you can still risk it if you want to wander the shores without a lifeguard on duty—though you may be subject to a fine if caught by police officials. Certain areas of the city are still prone to gun violence and high crime rates; make sure you know about the neighborhood near your hotel before you book your room.